Qatar secured its place to the finals of the AFC Asian Cup 2019 after winning the semi-finals match against the UAE with a 4 to nothing score. 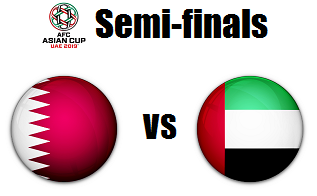 Despite being against the host nation UAE, Qatar managed to sneak in 4 goals and win in a very dominant fashion. Qatar started racking in the goals early with 2 goals all on the 1st half of the match. The first 1st goal came at the 22nd minute by Boualem Khoukhi then followed shortly by Almoez Ali at the 37th minutes. Tensions and emotions were quite high while the match was ongoing after some members of the crowd showing their frustrations by throwing bottles on the playing field which was eventually controlled. The 2nd half of the match continued with Qatar still controlling game which eventually led to the 3rd goal late at the 80th and 93th minute by Hassan Al-Haydos and Hamid Ismail respecfully. Qatar will now face Japan in the Finals of the AFC Asian Cup 10pm Friday, February 2, 2019 at ZSC Stadium.